Golfing stretches should be part of any training program. The mechanics of the golf swing require flexibility, coordination, strength and stability. Golfers with poor mobility will suffer in terms of generating club head speed and will likely develop compensatory adjustments to their swing that will lead to inaccuracy and injury. Why do we need to do golf stretches? What type of stretching is best for golf performance? What shoulder muscles are used most in the golf swing? Physics and the golf swing. Why do we need to do golfing stretches? Golf is an activity that requires strength, flexibility, coordination, and to a lesser extent muscular and cardiovascular endurance. Golfers with limited range of motion will be severely affected in their ability to generate club speed. Loss of range of motion is probably more important than loss of stretngth in affecting club speed in an aging golfer. Loss of spinal rotation, hip rotation, and shoulder range of motion affect how far back the club will start and the length of follow through. Power is dependent on the velocity of your swing as it hits the ball. The range of motion in your trunk directly correlates to the ability to generate club head speed. The golf club has a limited amount of time to accelerate during your down swing to achieve its maximum velocity at contact. By improving your flexibility, the degree of trunk rotation relative to your hips, hence, the distance of the upswing, you likewise increase the distance that the club has a chance to accelerate prior to contact with the ball. Golfing Stretches - What Type of Stretching is Best for Golf Performance? A study published in the International Journal of Sports Medicine in 2009 (1) examined the effects of static, dynamic, and no stretching on golf performance after their inclusion in part of a warm up. While there are many determinants of golf performance, golf performance in this study was measured as club head speed, ball speed, swing path, point of impact on the club head, and club face angle. Measurements of club head speed were taken immediately after stretching, five minutes after stretching. 15 minutes after stretching, and 30 minutes after stretching. Dynamic golfing stretches produced significantly greater club head speeds than static stretching and no stretching. This effect was present even 30 miniutes post-stretch. Dynamic golfing stretches produced significanly greater ball speeds than static stretching and no stretching. This effect was present even 30 miniutes post-stretch. Dynamic golfing stretches produced significantly straighter swing paths that static stretching and no stretching. This effect was present even 30 miniutes post-stretch. Dynamic golfing stretches produced impact points on the club face that were more centred that static stretching or no stretching. This effect was present even 30 miniutes post-stretch. The club face angle was not affected by stretching. There was no significant difference in club head speed between those that performed static stretches and no stretches. There was no significant difference in ball speed between those that performed static stretches and no stretches. There was no significant difference in swing path between those that performed static stretches and no stretches. There was no significant difference in the impact point on the club head between those that performed static stretches and no stretches. Recommendations based on this study suggest a good dynamic warmup is in order prior to a golf game to improve performance. One of the most important factors in determining clubhead speed is the ability to rotate the trunk during the backswing. People who have lost this due to age, injury, smoking, etc. will undoubtedly experience a drop in distance of their shots. Golfing stretches should be done regularly to increase and maintain mobility. Stand with your feet shoulder width apart with the protractor on the floor at your feetso that the thick black line runs between your big toes. Grip a driver with your one hand on the handle, and the other on th club head. Put the shaft over your head so that it rests lengthwise across your shoulders. 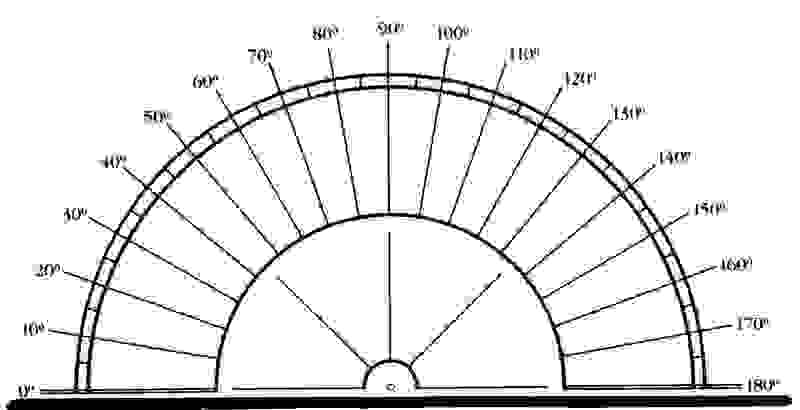 Your driver should now be parallel with the thick line of the protractor. Slowly turn your trunk as you would during a backswing while keeping your feet firmly planted on the ground. Hold this for a period of 30 seconds. You should pull only to the point of tension. You should not pull into any pain, bounce, or force the movement. You should push only to the point of tension while maintaining your hips on the floor. You should not push into any pain, bounce, or force the movement. You should have a gentle curve in your back as you push up, no severe curvatures in one location. Do not do this exercise if you have been advised by your physical therapist not to. If you have any pain or create new pains by doing this exercise consult your physical therapist. This is an effective hamstring stretch sitting on the ground, but depends on pelvic positioning. If you are able to maintain a straight lower back and anteriorly tilted pelvis while performing this stretch it is significantly more effective. To perform this stretch sit on the ground with your right leg stretched out in front of you and your left knee bent with foot facing your right knee. Hold this position for 30 seconds. For a discussion on how long you should hold a stretch see here. Sitt on the floor with your knees apart and the bottom of your feet together. Kneel on your right knee and put your left foot in front of you. If you find this uncomfortable on your knee you can put a cushion or rolled towell under your knee. 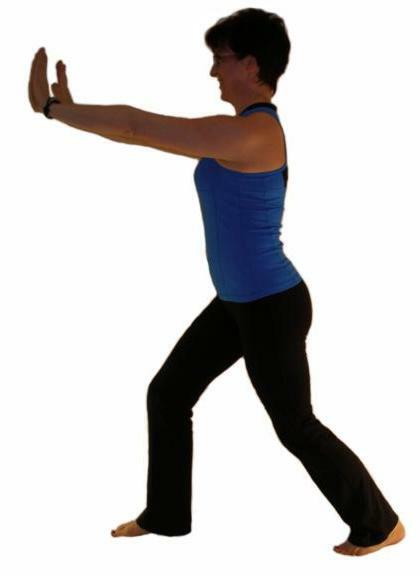 Lean forward and push your right hip forward. You should feel this stretch in the front of your right hip. Hold this position for 30 seconds and then perform this stretch on the other side. The hip rotators not only rotate the thigh on the pelvis but more functionally rotate the pelvis on the weight bearing fixed thighs such as with swinging a golf club. To stretch the right side in sitting cross your right leg over the left so that your right ankle is laying across your left thigh. Put your right hand on your right thigh and gently press down until you feel resistance. Stand with your chest lifted up and feet shoulder width apart. Be sure that you don't rotate your trunk while you are performing the stretch. Repeat this for the left side as well. The supraspinatus abducts and externally rotates the shoulder therefore stretching must involve adduction and internal rotation. Most people will benefit from holding this stretch for 30 seconds. Sit upright on a chair with your chest up and head over your shoulders. Raise your right elbow up to shoulder level in front of you. Let your right hand fall toward the floor, palm down. Grasp your right elbow with your left hand and pull your elbow over toward the opposite side. Exhale as you gently pull the arm across and make sure the elbow doesn't rise above shoulder level. Hold this stretch for30 seconds. A tight posterior joint capsule can restrict shoulder movement and cause impingement of subacromial structures such as the supraspinatus tendon, biceps tendon, and bursa resulting in tendonitis or bursitis. This stretch should not cause pain. If you suffer from any of the above conditions or have pain during this stretch be sure to consult a physical therapist. Because the fibres of this muscle lie in different directions, it is best to hit it from different angles. This iliotibial band stretch will address tightness in the iliotibial band on the right hand side. To do this stretch you must be able to comfortably sit on the floor and already have good hip mobility. Sit with your legs crossed, right leg on top . Slide the top leg across so that your knees are touching or try and get them as close as you can. Keep your back straight and bend your trunk toward the right foot. Hold this position for 30 seconds, relax and breath. Because part of the calf originates from above the knee, and part originates below the knee, stretching involves two parts. Bend the right knee and keeping your heel on the ground hold again to target the soleus. Standing or sitting, straighten your right arm out in front of you with your elbow straight with palm facing up. Grasp your right hand above your knuckles, and below your wrist and pull your hand down. 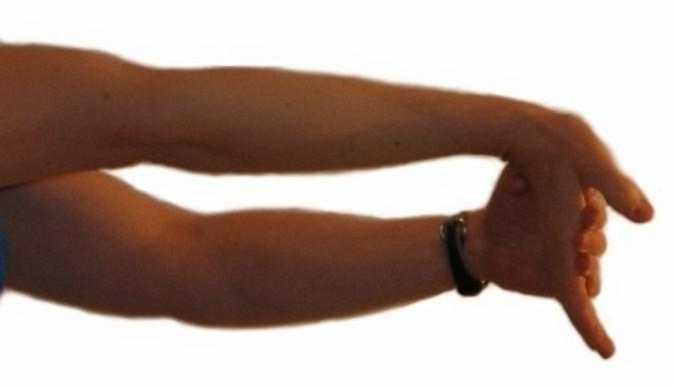 You should feel a stretch in the flexor muscle group on the front of your forearm. 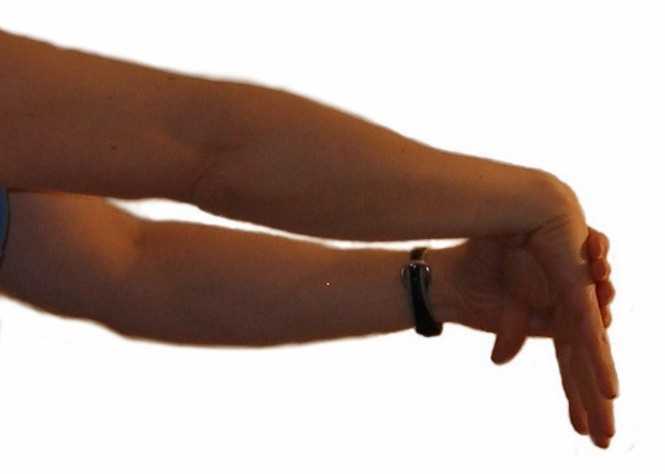 Tightness in the wrist flexors can predispose you to golfer's elbow (medial epicondylitis). Repetitive use of these muscles in activities such as gripping, tennis, golf, or assembly line work can cause microtearing and inflammation. This is a good stretch to do on a daily basis if you are involved in any of the above activities. This stretch should not ellicit pain. If you have pain during this stretch you may already have issues with the muscle or tendon(s) and you should seek the advise of a physical therapist. Sitting or standing, straighten your right arm out in front of you with your elbow straight with palm facing down. Grasp your right hand above your knuckles and pull your hand down. While your hand is down and elbow straight, pull your hand out away from midline so that your fingers are pointing to the right. Tightness in wrist extensors, particularly extensor carpi radialis brevis, can predispose you to tennis elbow. Repetitive use of these muscles in activities such as typing, tennis, golf, or assembly line work can cause microtearing and inflammation. This is a good stretch to do on a daily basis if you are involved in any of the above activities. This stretch should not ellicit pain. If you have pain during this stretch you may already have issues with the muscle or tendon(s) and you should seek the advise of a physical therapist. Stand tall with your chest up and head high. While holding your chin back, use your other hand to reach over the top of your head. This is not a large movement so don't force this stretch. Be sure to keep your chin retracted during this stretch to avoid shearing forces on the joints in your cervical spine. You want to stretch the muscles and other soft tissues on the posterior aspect of your neck, not stress the discs. If you have any discomfort during this stretch you may be doing it wrong or have underlying problems. Consult a physical therapist. Be gentle with this stretch. Older individuals will have significantly less range in this direction. 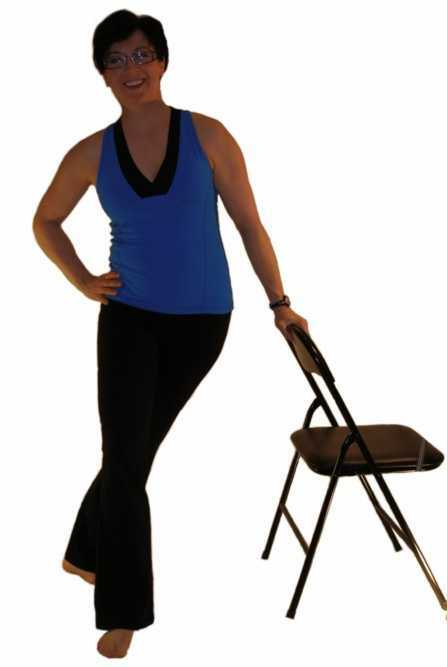 This one is an easy one to do in standing although you can also do it in sitting. The golf swing involves significant trunk rotation a lot of which occurs through your thoracic spine and neck. 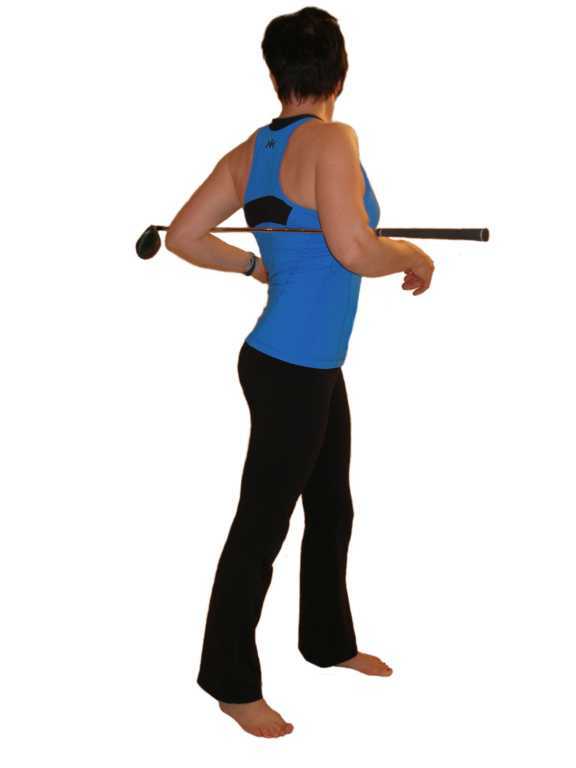 Hook your arms around the golf club placed lengthwise across your back. Rotate your trunk and head to the left and hold it there for 20 to 30 seconds. Don't swing and bounce into this stretch as that will put undue strain on the joints and ligaments of your spine. If you perform this stretch in sitting you will reduce the amount of stretch you get in the lower lumbar region. Stand beside your cart or a wall so as to hold on with one hand if necessary to balance. Grab your ankle behind you. You can use the hand on the same side or the opposite side. Most people find using the opposite hand most comfortable because it allows the hip to stay in a comfortable position. If you are able to bring your knee behind you as in the picture you can stretch rectus femoris as well. Hold this position for 30 seconds and then perform this stretch on the other leg. What shoulder muscles are used in the golf swing? Electromyographic studies have shown that the latissimus dorsi along with the pec major provide significant power to the golf swing. Seven healthy right handed male golfers used to study activity in the following shoulder muscles: supraspinatus, infraspinatus, subscapularis, latissimus dorsi, anterior posterior and middle deltoid, and pectoralis major. Activity of these muscles in the right shoulder were then compared to the left shoulder during a right handed swing. Results showed that the deltoid was relatively inactive on both sides and supraspinatus and infraspinatus fired at low level throughout the swing. The subscapularis was very active thoughout the swing, and the lat dorsi and pec major appeared to provide most of the power on both sides with most activity occuring with the downswing. Contrary to popular belief, the rotator cuff muscles on the left showed just as much activity as those on the right. Fun Physics facts and the golf swing. Swing path anomalies result in half of flight misdirection when compared to the position of the club face. For instance a 10 degree error in clubface will create as much misdirection as a 20 degree error in swing path. There is little margin for error in positioning club face. Two degrees off alignment can mean putting the ball in the rough at 200 yards. In order to achieve maximum force on impact the club head shouldn't pass the line from the leading arm to the club head until after the ball leaves the club face. More than four horsepower is required to hit the ball the same distance as a pro. By the time you feel the impact of the ball on the club face and determine that you need to make a change to your swing, the ball has already travelled about 15 yards. When hitting into a wind that is 48 km/hr a ball that is hooked or sliced will curve five times as much if it is hit in the direction of the wind. Transfer of momentum from the clubhead to the ball is achieved most efficiently when the ball is hit at the "sweet spot" (ie centre of mass). A hit that is as little as one centimeter off of the centre of the club face will make a difference of about 15 yards. 2. FW Jobe, MD, DR Moynes, MS, RPT, DJ Antonelli, PhD. Rotator cuff function during a golf swing. Am J Sports Med September 1986 vol. 14 no. 5 388-392 .